I absolutely loooove roast chicken. 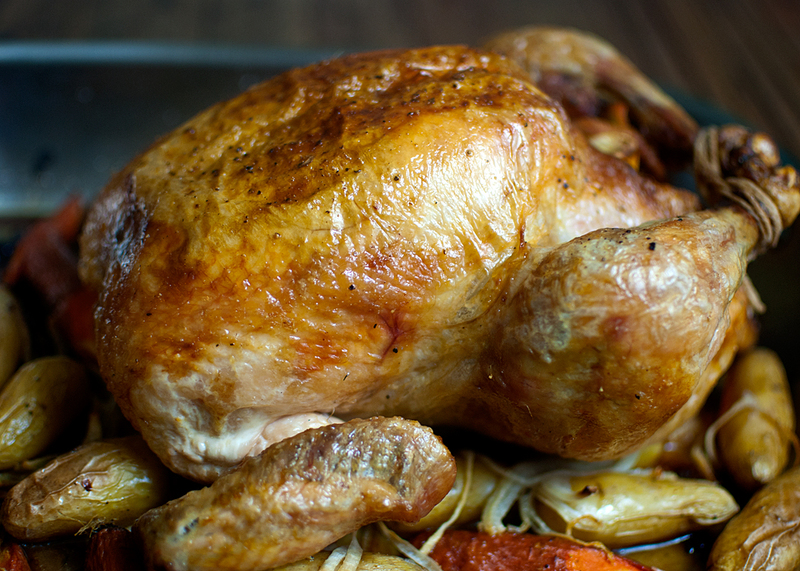 There is something so very comforting about roasting a chicken and even more so eating it. I have a few recipes I love but I’m always looking for a new one. So are most people from the number of different recipes you can find for how to do it. Some have you turning it several times, some have you changing the temperature midway through, some have you stuffing it with various aromatics and some have you putting most of the herbs on the skin. What’s a cook to do? How do you get the most flavor into your chicken? How do you make sure you get a nice, crispy but still flavorful skin? Well, I’ve decided that the reason there are so many recipes is because we have so many different moods for our chicken. There are different things to love about each recipe. This one is from the Barefoot Contessa and the things I love about this one are the way the vegetables turned out and the overall ease of the dish. You roast the vegetables with the chicken in the same pan, so that’s ultra easy, and you roast it at the same temperature for the whole cooking time, again easy. The flavor was good, although I can’t say that using a whole head of garlic was worth the resulting garlic flavor in the finished chicken, so I’ve cut that down in my version. This is definitely a Sunday supper worthy dinner and a keeper in your pile of roast chicken recipes for all the above reasons. -Remove the chicken giblets and pat outside of the chicken. Place the onion, potatoes, and carrots in the roasting pan and add the olive oil and 1 tsp salt. Toss together until evenly coated. -Put the chicken on top of the vegetables and liberally salt and pepper the inside of the chicken. Stuff the cavity with the bunch of thyme, both lemon halves and the garlic cloves. Brush the outside of the chicken with the butter and sprinkle again with salt and pepper. Tie the legs together with kitchen string and tuck the wing tips under the body of the chicken. -Roast the chicken for 1 1/2 hours or until the juices run clear when you cut between a leg and thigh. Remove the veggies and chicken to a platter or cutting board and tent with foil while you make the gravy. -Remove the fat from the bottom of the pan, reserving 2 tablespoons in a small cup. Add the chicken stock to the pan and cook on high heat for about 5 minutes, until reduced, scraping the bottom of the pan. Combine the 2 tablespoons flour with the reserved chicken fat and add to the pan. Boil for a few minutes to cook the flour. Strain the gravy into a small saucepan and season to taste. Keep it warm over a low heat while you carve the chicken. -Slice the chicken onto a platter and serve immediately with the warm gravy. This entry was posted in main dish, Posts and tagged roast chicken.